Our new product Mergebot is getting very close to the stage of being ready to put in the hands of our beta testers. As such I went through the process recently of setting up the Laravel app on our production architecture. We decided early on to go with Amazon Web Services (AWS), specifically Elastic Beanstalk, to host the app as it has a solid reputation for being a decent hosting provider and also offers us everything we need in terms of infrastructure (e.g. load balancers, auto scaling, relational database, custom VPC etc.). When I started out I was surprised to find that there seemed to be quite a lack of public information available about setting up Laravel on Elastic Beanstalk. I had assumed that there must be plenty of companies running large scale apps using Laravel and, given the popularity of AWS and Elastic Beanstalk, I expected there to be quite a bit written about the process of setting it up. For once Google didn’t give me much concrete advice, and certainly not anything that was in-date (i.e. setting up Laravel 5.x apps on the current Elastic Beanstalk platform). To gain all of the benefits of horizontal scaling, your app needs to be thoroughly decoupled so that resources can be shared across all of the servers in your cluster, whether you have 1 or 100 servers. What does it mean to decouple your app? As an example, consider an app that allows you to login and upload photos. With a single server, the user session and any photos the user uploads can be stored on the server file system. However, with a horizontally scaled app you might have many app servers that need shared access to the user session and uploaded photos. So you need to decouple the file system from the app server. This is normally done by either using a shared storage volume or storing the data in an external service that can be accessed by all the servers in the cluster (e.g. a database or Redis cache). We are going to make some tweaks to our Laravel app to make sure the app is properly decoupled and ready for horizontal auto scaling. In this series we are going to copy the architecture that we currently employ in Mergebot, namely storing files in S3 instead of the local file system (except for temporary or development files), storing session data in the database, using Redis for cache data, and using Elastic Beanstalk’s worker environment (which uses SQS) to handle queues (more on this later). We can then input the correct environment variables in our .env file when developing locally, or set the environment variables in Elastic Beanstalk (we’ll deal with this later in the series). For local development I recommend using the Homestead VM as it comes with Redis pre-installed and means you don’t need to install it on your local machine. Normally at this point you would run a queue listener php artisan queue:work in a process manager like Supervisor to make sure the queue listener is always running. However Elastic Beanstalk does things a bit differently. Elastic Beanstalk has the concept of worker environments which are separate from the normal web environments and designed specifically for dealing with jobs that have been added to an SQS queue. Servers in worker environments come with Amazon’s own SQS daemon to deal with incoming messages from an SQS queue, which is nice because it means we don’t have to set up our own daemon to deal with Laravel’s built-in queue listener. However, Laravel is not built to work with the SQS daemon so we need to install an extra package to get things working. While we could manually implement an interface for the SQS daemon, I found that this laravel-aws-worker package from Denis Mysenko seems to work well. The SQS daemon is designed to POST an incoming message from the SQS queue to our app (rather than the listener fetching a message from the queue as Laravel’s built-in listener does). The laravel-aws-worker package adds an extra /worker/queue path to our app to handle these incoming messages from the SQS daemon, and hands them off to Laravel to be processed. By default the SQS daemon will POST messages to the base path / but we will change that in the configuration later when we set up the environment in Elastic Beanstalk. Now that our Laravel app is decoupled there are a few final tweaks we need to make to make sure our app works properly on Elastic Beanstalk. Another aspect of Elastic Beanstalk that the laravel-aws-worker handles is dealing with cron jobs and task scheduling in Laravel. We can’t have every server in our cluster configured with the same cron because each cron job would then be triggered multiple times when we only want it triggered once. Elastic Beanstalk deals with this automatically by allowing us to specify a cron.yaml file in our worker environment which handles all of the cron complexities for us (again by POSTing a request to the specified endpoint). Now the worker environment will POST to /worker/schedule every minute and the laravel-aws-worker package will offload this to the Laravel scheduler. 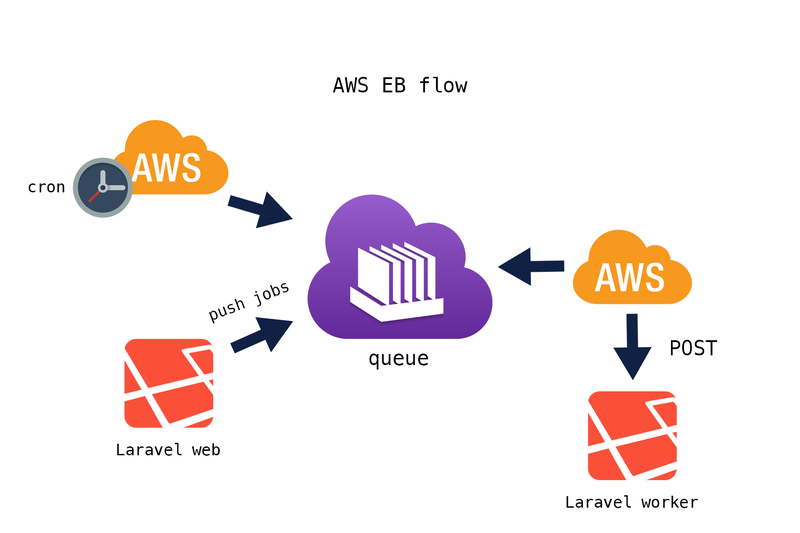 Have a read of this blog post by Denis if you want to know more about how the laravel-aws-worker package works. One other issue you will find is that when you are behind a load balancer (or any kind of reverse proxy) things like sessions, redirects, URL generation etc. might break because the server isn’t receiving the traffic directly but instead receiving traffic from the load balancer. The load balancer might know your site is at the domain example.com but the server receives traffic from the load balancer which might have some random hostname or IP. Thankfully AWS helps us out here by sending the correct info via X-Forwarded headers. However Laravel is not configured to handle these X-Forwarded headers so we need to install a package to tell Laravel what to do here. AWS does not document their load balancer IP addresses (as they are constantly changing), and so we must trust all possible addresses (*). The default headers will work fine here. At this stage our Laravel app should be suitable to be deployed on AWS Elastic Beanstalk and auto scaled horizontally. In the next article we will look at setting up supporting services in AWS such as a VPC, a Redis ElastiCache and our RDS MySQL database. Have you ever hosted Laravel on Elastic Beanstalk? Do you have any experience scaling Laravel? Have you ever used Elastic Beanstalk or auto scaling on a different project? Let us know in the comments. This entry was tagged Amazon Web Services, Laravel, Scaling, Elastic Beanstalk.